Unfortunately, there is no linear relation between person talents and his ability to get a job. One of the greatest obstacles standing in your way to get a job is the job interview. if you want to improve yourself and get the job, In this interview guide, I would help you with the task of preparing for an interview and give you some important tips for a job interview. This comprehensive interview guide was written for you, the job seeker. pleasse, let me know if you found the interview guide helpful or if you have some ideas how to improve the interview guide. The person who interviews us represent an organization and checks our credentials and whether we are suitable for the job or not, but the thing that is most important for him, consciously or unconsciously, is whether or not he wants to see you every morning at work. Remember that most of our decisions are emotional, and not logical. The interviewer needs to connect with you and like you. In many positions, the one conducting the interview will also be in contact with you on day to day basis so he has to like you. He is going to see you day after day, therefore he has to find you likable. This is homework time. We should Google the company. We should study its conditions, main customer and main area of business. We should study the job we are applying for before the interview. We should think of 3 qualities we have that we would like to stress out in the job interview no matter what question we are being asked. The best of our qualities that we would work into the job interview when it fits regardless the questions we are being asked. The message we are trying to convey is our greatest abilities, our unique qualities and how well we fit for the job at hand. We should prepare for the job interview. We should practice in front of the mirror or before friends. We have to plan answers to the obvious question, for example, “why do you think you are good for this job?” or “why did you leave your previous job?” We should practice these questions over and over again until the answers are fluent and authentic. We should enter the room smiling and calm. Do not complain if the job interview started late, if the room is hot or if you had a hard time looking for a parking space. We must be positive, optimistic and full of joy. We need to wait patiently until the interviewer addressing us. If we can, it would be wise to make some Smalltalk. Say a little thing about the interviewer family photo or about his favorite football team. The main point is to authentically relay to the interviewer. Remember, it is all about relationships. On this part of the interview guide, I would like to give you a list of job interview tips that would help you ace the interview. let us begin to guide you through the interview. Answering questions – we should be brief, focus on the subject and answer exactly the question we were asked. Never avoid a question and if you do not understand it, ask a clarification question. Self-marketing – we must remember the job interview is not an informative gathering. The usual details are on our resume. Believe it or not, but we are on a sales pitch. We are pitching ourselves for the job. We should, therefore, mention our success stories and our special talents. We should pitch our experience, our knowledge, and our lovely personality. We must make the impression that hiring us would be beneficial to the interviewer himself, to his boss and to the company. 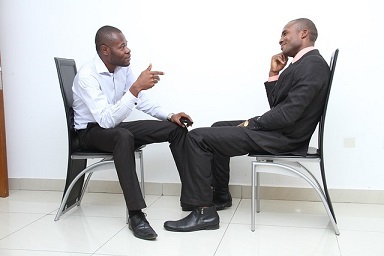 Mutual interview – some people become a “yes man” at job interviews. They don’t express themselves. They only sit there answering questions and nodding their head. It is important to understand that a job interview is mutual. It is not just the interviewer that checks us; we also need to check the job. We want to see if the job fits us and if we like it. We need to inquire, ask for details and to try and truly understand the nature of the job. To send the message that we will take any job, anytime, anywhere will not raise our value in the eyes of the interviewer. Don’t take over – we must respect the interviewer and not take over the job interview. We should not intimidate him in any way. We do not want to convey that we are aggressive bossy persons. Authenticity – an interviewer, especially experienced one, can read us few seconds within the job interview. They can spot fake, lies and any sort of artificial behavior. We have to be as authentic and as natural as we can. Talk the talk and walk the walk – we should bring into the job interview the same qualities the job requires. If it is an interview for management position we should show initiative, leadership, and self-confidence. If we are being interviewed for an administrative position we should show punctuality and self-discipline. If the job interview is for a salesman position we should be enthusiastic and persuasive. We have to stress out our characteristic that suit the job description. During the job interview, we should look the interviewer in the eyes, we shouldn’t stare at him, but we have to make eye contact. We should finish the interview stating clear and out loud that we are very enthusiastic and about the job, we need to make it clear we want the job and that we are positive that the company will benefit greatly if we got the job. We can ask the interviewer directly if he or she thinks we are suitable for the job. We need to ask him what is going to happen next and how long will the process take. If we got friendly with the job interviewer we can ask him for feedback about our job interview performance. You will be surprised how much one can learn from such a feedback. Make contact – the number one ingredient of influencing people is to relate to them on an emotional level. Remember, it is all about relationships. Make it an experience – if our interview was interesting, different and unforgettable we will increase the chances of getting hired for the job. Make promise – we need to make a promise of our future benefit for the company and make it clear how much value we will bring to the company. show decision-making ability – we must show our process of decision-making. Hope you enjoyed the interview guide, now the ball is in your court – tell me in the comments what are you most afraid of on a job interview?